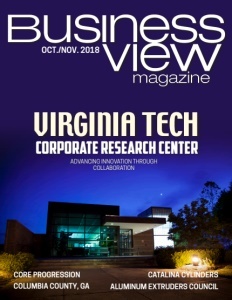 Business View Magazine interviews Jeff Henderson, President of the Aluminum Extruders Council, for our focus on Strength & Growth in the Aluminum Industry. The Aluminum Extruders Council (AEC) is an international trade association dedicated to advancing the effective use of aluminum extrusion in North America. The non-profit organization delivers comprehensive information about extrusion’s characteristics, applications, environmental benefits, design, and technology to users, product designers, engineers, and the academic community. A commitment to enhancing members’ ability to meet emerging market demands through knowledge sharing and best practices is the Council’s key focus. Jeff Henderson is Aluminum Extruders Council President and a passionate champion for aluminum extruders and their overall value to the manufacturing sector. Henderson held nothing back in a recent interview with Business View Magazine, where he extolled the benefits of AEC membership, the state of the industry, and AEC’s ongoing advocacy efforts in the wake of Section 232 trade enforcement issues. The following is an edited transcript of that conversation. BVM: Could you give us a basic tutorial on the aluminum extrusion process? Henderson: “We usually describe it like the old Playdoh machines, where you push Playdoh through the device and out come stars, and squares, and triangles. We essentially take aluminum logs through a hydraulic press, push those logs through a heated steel die, and out come aluminum profiles – in theory, an infinite number of designs for an infinite number of applications. What makes the extrusion process so interesting in the supply chain is that our applications range everywhere from storm windows to the crash management system in a brand new car. A typical extruder will have 30,000 dies, each with a unique profile, and new applications are developed every day. BVM: Why was the Aluminum Extruders Council formed and what is its current mandate? Henderson: “The Aluminum Extruders Council was started in 1949 by leaders in the aluminum extrusion industry. Back then, the biggest issue for individual extruders was access to aluminum. Metal was being rationed, and by forming a Council they were able to join forces to get the material they needed. It was really in the early stages of the industry. Pre-World War II, aluminum just came in rods, bars, and basic shapes. Other applications developed through the war years, and when it ended, a myriad of applications were taking form, mostly in the building construction market, where window and door systems usually had aluminum extruded frames. 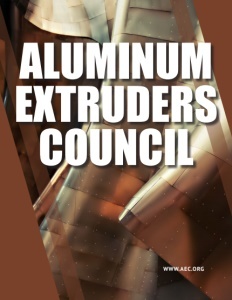 BVM: How many members belong to Aluminum Extruders Council? Henderson: “We currently have 121 member companies – 50 to 60 percent extruders and 40 – 50 percent suppliers or metal producers. Remarkably, that number has remained fairly consistent over the last 20 years while there’s been major consolidation in our industry. Even though there are fewer companies, our membership number sustained itself or even grew a bit by keeping the newly merged companies (where two or three became one) and also picking up others. The Aluminum Extruders Council represents 80 to 85 percent of total domestic product of aluminum extrusions in the U.S. and Canada. BVM: What are the key benefits of membership? Henderson: “The AEC’s basic three-prong strategy was developed in 2008 and summarizes the Council’s ambition to promote and grow the industry; to protect the industry against any threats (i.e. trade issues); and to become better at what we do. Every program, every dollar, and every hour we spend on the Aluminum Extruders Council traces back to one of those three items. So, when I’m a member, I have an association that, in the last six or seven years, has developed over 15,000 names of engineers, architects, specifiers – decision-makers about whether to use aluminum or another material on a given project. On that list are people who downloaded our design manual, attended a webinar, visited us at a trade show booth, or contacted the AEC office to ask for more information. “In business excellence, we have trained over 4,500 people in the aluminum extrusion industry in some area of production, since 2011. Employee training and safety committee are very big membership benefits. 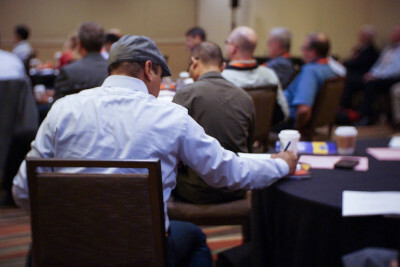 We teach best practices from around the industry to beginner, intermediate, and even some advanced sessions. BVM: What impact is the NAFTA dilemma having and how are you addressing members’ concerns? Henderson: “It’s a very difficult time for our industry. A lot of extruders, whether in the U.S. or Canada, operate on both sides of the border. And even more have customers on the other side. We are deep enough into the supply chain, where most extruders don’t just push the metal out of the press. They fabricate it, CNC (Computer Numeric Control) machine it, anodize it, paint it, they may even kit it or assemble it into something. They are very involved in the downstream; some are criss-crossing the border two or three times with the same stick of metal, performing various value-adding services before it reaches the manufacturer. We’re hearing a lot of confusion about how the orders will be administered, which has led to frustration, and the 232 has certainly had an impact on investment decisions. BVM: How do you see the industry evolving and what are the Aluminum Extruders Council’s goals for the next decade? Henderson: “In the last few years, automakers have moved from steel to aluminum and we believe that’s the beginning of a bigger revolution. We expect we’ll see a broadening of applications for aluminum extrusions, especially, anything to do with electricity because aluminum brings great conductivity and the ability to dissipate heat. “Talking about electric vehicles, or LED lighting, or the new electrical grid, aluminum extruders are all over it. There has been tremendous growth in the usage of aluminum extrusions in the renewable energy sector for solar and wind energy systems. An extrusion plant is a huge consumer of energy, mostly natural gas. In the future, we expect we’ll be leaner, in terms of energy consumption, and more maintenance-free in the process. Check out this handpicked feature on Aluminum Shapes LLC.